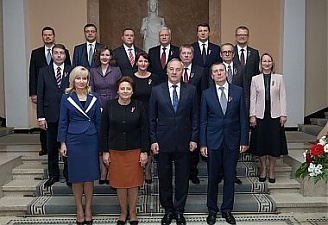 During an emergency session today, Latvian Saeima approved the new Laimdota Straujuma (Unity) government. 61 MPs voted for the new government, while 39 voted against, reports LETA. This will be the second government headed by Straujuma, and Unity will be represented in the new government by Straujuma, Finance Minister Janis Reirs, Foreign Minister Edgars Rinkevics, Interior Minister Rihards Kozlovskis, Transport Minister Anrijs Matiss, and Education and Science Minister Marite Seile. The Union of Greens and Farmers will be represented in the new government by Agriculture Minister Janis Duklavs, Defense Minister Raimonds Vejonis, Welfare Minister Uldis Augulis, Economy Minister Dana Reizniece-Ozola, as well as Health Minister Guntis Belevics. Meanwhile, All for Latvia!-For Fatherland and Freedom/LNNK will be represented by Environmental Protection and Regional Development Minister Kaspars Gerhards, Justice Minister Dzintars Rasnacs and Culture Minister Dace Melbarde. The new government will be made up of six new ministers – Seile, Reirs, Reizniece-Ozola, Belevics, Gerhards and Rasnacs. Five ministers from the previous Straujuma government will not continue work in the new one – Finance Minister Andris Vilks (Unity), Education and Science Minister Ina Druviete (Unity), Economy Minister Vjaceslavs Dombrovskis (Unity), Environmental Protection and Regional Development Minister Romans Naudins (VL-TB/LNNK), and Justice Minister Gaidis Berzins (VL-TB/LNNK). Addressing Saeima today, Straujuma said that the new government is a professional one, and one that is willing to work. ''We have balanced a fresh outlook, with experience and succession. My team has four ministers who do not have previous experience working in the government, seven ministers who were part of my first government, and two ministers with previous experience working in the government,'' the politician explained. She also emphasized that the coalition partners have agreed on a government based on succession, and that the work of the previous government and its policies will be continued.